Relax your muscles and rest your mind with a massage at Uptown Spa in Toronto. Our certified massage therapists use their skilled touch to relax tense muscles and soothe body aches, combining the therapeutic benefits of massage with the comfort of a luxurious spa setting. At our tranquil oasis in North York, you can enjoy the ambiance of your own private fireplace with soothing sounds and scents to help you find your own personal paradise. Each of our unique registered massage therapists has their own massage technique, and they can tailor your massage experience to your needs. Enjoy a relaxation or hot stone massage, shiatsu or muscle energy techniques, clinical or craniosacral therapy, sports massage or prenatal massage, neuromuscular integration and structural alignment (NISA) or positional release techniques, and more. At the spa, you and a loved one can even enjoy a bonding opportunity with couples massage. With so many massage options to choose from, Uptown Spa is the best way to forget your troubles and find your oasis. “Excellent! My massages are ALWAYS excellent!” Natalie K.
“It was my first experience at Uptown Spa and it was great. Julie gave an amazing and relaxing massage and knew her job well. Evelin was so good with the pedicure and manicure. Mark gave me a great look by doing my hair.” AMARJIT S Customer since 2017. Uptown Spa’s fully-licensed Registered Massage Therapists (RMTs) have training in proper massage and techniques and etiquette along with anatomy knowledge. This allows them to combine the therapeutic benefits of massage with a soothing, relaxing spa experience. If you need a sports massage to target sore spots and injuries, we can do that. If you want a prenatal massage to ease your pregnancy aches while ensuring safety for your unborn child, we can do that. If you want to ease the aches of arthritis or a even a gardening injury, we can do that too. Massage allows you to combine an enjoyable experience with health benefits for your body and mind. The most popular type of massage therapy at Uptown Spa is Swedish massage, also called classic massage. These body works target general muscle aches and joint stiffness, rubbing, kneading, tapping, or using other techniques in a light to vigorous manner. Positional release can help ease tissues into a more comfortable position, helping reduce pain and stiffness. A deep tissue massage will reach deep muscle layers, targeting deep injuries or strained muscles in athletes or others. Benefits of a deep tissue massage include helping ease pain and improving movement as well as lowering heart rate, blood pressure, and stress. This type of massage can provide therapy for your body along with your mind. The massage therapists at Uptown Spa provide reflexology, applying pressure to certain areas of your feet, targeting other areas of your body. People often seek this type of foot massage as a form of alternative therapy, but you can also enjoy a foot or hand massage as part of your pedicure or manicure at the spa. Alternatively, trigger point therapy can provide benefits such as reducing local pain, and craniosacral therapy (CST) uses gentle touch on your head or other areas to relieve tension. Shiatsu at Uptown Spa is a specific type of bodywork that uses hands to apply pressure to various parts of your body, also used as an alternative therapy. For the ultimate spa experience, Uptown offers hot stone massage. These heated stones help enhance your massage experience by providing soothing heat to promote your relaxation. Other popular massage types include lymphatic drainage massage, lipomassage, ashiatsu, reiki healing, osteopathy, Indian head massage, Thai massage, and bamboo massage. 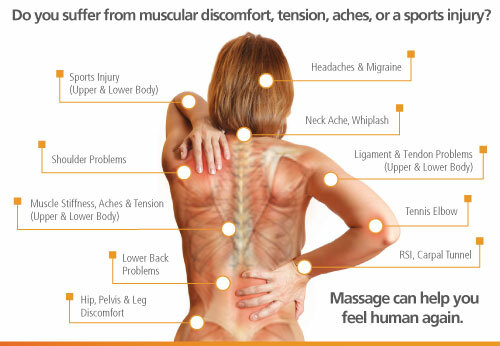 Speak to your Uptown Spa massage therapist about what treatments are available to ease your aches away. If you want to experience a head massage or body massage, or target aches in a specific area of your body, your professional massage therapists can tailor your treatment to meet your needs. Uptown Spa is located at 801 York Mills Road in North York, Ontario, Canada, west of Don Mills Road and east of Leslie Street. We are located only 4 km from Yonge Street and 14 km from Bay Street in downtown Toronto. Some of our clients even travel from Bloor West Village, bypassing their local massage clinic to seek our spa oasis, one of the best places in Toronto to get a massage. Book an appointment online or phone us for more information about our therapeutic spa services including rates. Our busy spa cannot guarantee walk-in appointments will be available, so call today to schedule your massage. Your personal paradise awaits. Our Massages are therapeutic only please do not ask for additional non therapeutic services. Registered massage therapy services paid by Gift card do not qualify for a insurance receipt.